Effective translation of ideas to products. ThoughtOffice Innovation Solutions make it easy to generate results right away – guaranteed. Simply enter a word or phrase and explore over 9,523,680 results. Instantly tap the minds of over 200 PhDs, MBAs and Domain Experts with ThoughtOffice Expert Topic Modules, drilling-down on any subject, problem or creative challenge. Watch the ThoughtOffice videos to see how ThoughtOffice can work for you. Bring it all together and present it with your logo, name, copyright and brand intact. 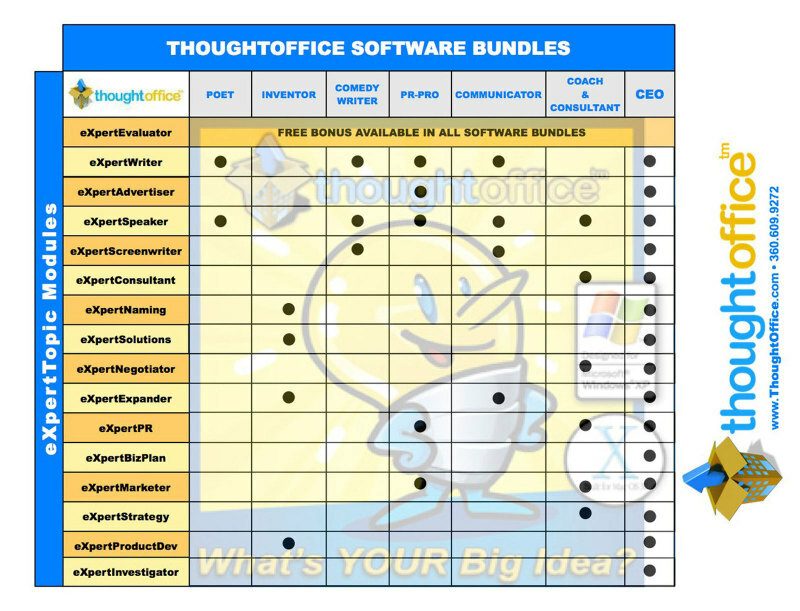 Find your best solution below as a prepackaged “bundle” of ThoughtOffice Software and various Topic Modules. Or build your own with ThoughtOffice and any collection of Topic Modules. Either way, you’ve just found the easiest way to become the “Idea Hamster” in your organization — the secret weapon of over 420 of the Fortune 500, and over 375,000 creative organizations worldwide. NOTE: All ThoughtOffice software products are delivered IMMEDIATELY via download, so you can get started on your project without delay*. If you also ordered ThoughtOffice shipped on a CD, you’ll receive the download now, and the physical CD will arrive within about 5-7 days of your order. We believe you will find ThoughtOffice Brainstorming Software an essential tool in your quest to be creative NOW! For more detailed information, please download our USER GUIDE here. *Your Serial Number will be emailed within 2 hours of your order, Monday through Saturday, 8 AM to 10 PM, Pacific time, after verification of your order details. In the interim, you have full access to the core program, in demo mode.